Exelixis Investment Public Limited announces that the consolidated results for the period ending June 30, 2009 are expected to lower compared to the corresponding results of 2008. Pursuant to the CSE and SEC Regulations and in order to fully inform the shareholders and the investing public in general, Exelixis Investment Public Limited announces that the consolidated results for the period ending June 30, 2009 are expected to lower compared to the corresponding results of 2008. The drop is attributable to the global economic crisis which has affected negatively the profits of the 77% subsidiary Neda International SA and the 70% subsidiary of Gortynia Shipping SA. We are at your disposal for further information or clarifications. Sanyo Hellas Holding S.A., in December 2006, acquired Exelixi Investment Public Limited, a company listed on the Cyprus Stock Exchange. Exelixi Investment Public Limited is primarily active in investments in shares and all forms of derivative products and services, as well as investments in real estate. Moreover, following a relative approval that was granted to the company by the Cyprus Stock Exchange with the consenting opinion of the Capital Market Committee of 15 November 2006 and the approval of a relative voting of the Extraordinary General Meeting of the company of 6 December 2006, the company will expand its investment activities to listed and non-listed companies, to international sectors, including, indicatively, transportation (land, sea and air), real estate development and exploitation, shipping, energy and others. 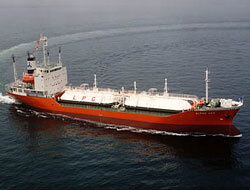 In January 2007, Exelixi Investment Public Limited acquired 95% of Shelton Shipping & Trading Corporation. Shelton Shipping & Trading Corporation is active in investments in the shipping sector and holds 30% of Romylia Shipping Company Ltd, which is the owner of a 73,000 dwt panamax bulk carrier. In July 2007, Exelixi Investment Public Limited incorporated Neda International S.A., in which it has a holding of 77%. In October 2007, Neda International S.A. acquired m.v. "Dimitra", a 41,445 dwt bulk carrier built in 1995, for a total consideration of US$ 38.9 million.